Paul Janssen was the founder of Janssen Pharmaceutica, a pharmaceutical company with over 20,000 employees. In 2005 he finished as runner up, after Father Damien, in the poll for The Greatest Belgian organized by the regional Flemish television. On Wednesday 22 October 2008 Dr. Paul Janssen was awarded the title of Most Important Belgian Scientist, an initiative of the Eos magazine. During his military service, he worked at the University of Cologne in Germany at the Institute of Pharmacology of J. Schuller, where he worked until 1952. After he returned to Belgium he worked part-time at the Institute of Pharmacology and Therapeutics (University of Ghent) of Professor Corneille Heymans, who had won the Nobel prize for medicine in 1938. Janssen founded his own research laboratory in 1953, with a loan of 50,000 Belgian francs from his father. In 1953 he also discovered his first drug ambucetamide, an antispasmodic found to be particularly effective for the relief of menstrual pain. In 1956, Janssen received his teaching certificate for higher education in pharmacology (Venia legendi) with a thesis on Compounds of the R79 type. 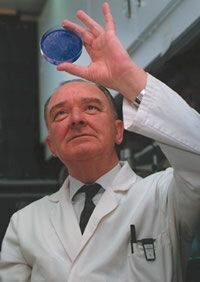 He then left the university and in 1956 established the company which would become Janssen Pharmaceutica. On 11 February 1958 he made haloperidol, a major breakthrough in the treatment of schizophrenia. 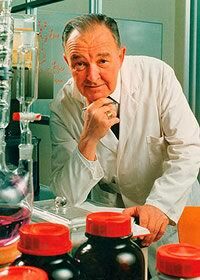 Paul Janssen and his team developed the fentanyl family of drugs, and many other potent analgesics, such as droperidol and etomidate which made a significant contribution to anesthesiology. One of the drugs he developed for the treatment of diarrhea, Diphenoxylate (Lomotil), even made it into space and was used during the Apollo program. In 1985, his company was the first Western pharmaceutical company to set up a pharmaceutical factory in the People's Republic of China (Xi'an). In 1995 he founded the Center for Molecular Design, together with Paul Lewi, where he and his team used a supercomputer to search for candidate molecules to find a treatment for AIDS. Janssen and the scientists at Janssen Pharmaceutica discovered more than 80 new medicines. Four of his medicines are on the World Health Organisation (WHO) list of essential medicines; this is a world record. The majority of the drugs he and his teams developed were for human medicine and are being used to treat infestations by fungi and worms, mental illnesses, cardiovascular diseases, allergies, and gastrointestinal disorders. For his contributions to medicine, Janssen was honoured on several occasions and he received more than 80 medical prizes and 22 honorary doctorates. In 1990 Janssen was knighted by King Boudewijn I of Belgium and became a Baron. He died in Italy on 11th November 2003.